Keep My Marketing Job or Join a Piano Bar Rock Band? I’ve gotten very bored with my corporate lifestyle as a marketing professional. My favorite piano bar rock bank in Philly has asked me to audition. I really would love to do this as music is my passion but I don’t know if I can. I’ll definitely make less money. My job right now pays $40,000 a year and I work 40 hour weeks. The piano bar gig isn’t as bad as you’d think. They have benefits that are roughly equal to my current job. I’m not sure exactly what they make, but if I was able to get 40 hours a week, they get tips on top of a decent base wage so I’m thinking around $15/hr. My main expenses are my student loan payment of $290/month (about $28,000 balance), my rent of $300/month, and car payment, insurance, and gas that come in at $447/month (I drive a 2012 Honda Civic EX-L with about 30,000 miles and I use it pretty much exclusively to get to my job, loan balance is around $15,000). My current job has a round trip commute of about two hours a day and I get two weeks paid vacation. Right now I work out in the suburbs and the piano bar is within walking distance of my house. I live in the city of Philadelphia and don’t want to move. What do I do?!?! I want to make a responsible financial decision. TMONEY: Thanks so much for hitting me up Mary! There’s a lot I’m excited about digging into from what you gave me. The first thing I noticed is that there are some significant savings that you can get if you quit your marketing job that will make the income differential between the two opportunities much less difficult. So we’re comparing apples to apples the approximate yearly salary from the band would be 40 hours a week *50 weeks a year * $15 / hr = $30,000 a year. You say that the band job is close to where you live right now. Assuming you are unwilling to move and that you have a typical tax situation living in Philly, the tax you pay on every additional dollar of earnings (marginal rate) is 3% for PA, 4% for Philly, 15% for the government, and 6% for Social Security/Medicare. In total that comes about to about 3+4+15+6 = 28% that you’re losing for each dollar that comes in the door. These numbers make your car a particularly heavy financial burden. You said all-in expenses on the car were about $447 a month. Assuming the car is under warranty and there are no additional recurring expenses, the total cost comes in at $5,364 a year. However, that’s not the full story because you have to use take home money to pay that. In other words, you have to earn more than that amount to pay it every year because you lose some of your paycheck to taxes. So using that 28% marginal tax rate, you’d have to earn 5,364 / (1 – 0.28) = $7,450 each year just to pay your car bills. If you were to quit your job, assuming you’d be able to offload the civic which I think isn’t too out of the question since the blue book value I looked up is about $14,400, you could add the car savings to your income at the bar since that’s money you wouldn’t have to make each month. So now we’re at $40,000 marketing salary vs $37,450 for your dream job doing covers to Iggy songs. Another eye popping number was how long you are stuck in traffic driving to and from work. 10 HOURS A WEEK HOLY CRAP!!! How do you not go insane? I hope you practice singing or something because that’s a ton of dead time. How much is this time worth to you? If I break down your hourly wage at your current job with 2 weeks vacation, it’s about $20/hr. Since this guy says he thinks $10/hr is a good number for valuing free time let’s go with that. So each week you lose $10/hr *10 hours =100 bucks sitting in traffic. If we multiply this by the 50 weeks a year you’re driving to work this comes in at $5,000. WAIT!! Is this right?!?! “How could I be losing cash sitting in traffic?” you ask. Well say you were able to pick up some shifts at your new job for other people and work longer than the 40 hours a week. If you got time and a half you could work an extra four hours and get another $90 added to your paycheck. You don’t have this option now, you’re stuck mindlessly staring at the bumper in front of you without anything to do for 10% of your waking hours in life. If you didn’t use the extra time to make more money maybe you use it to practice, investing in your skill set, and bringing down the 10,000 hours you need to become an expert at something. You could use the time to work out in the gym or do some dogwalking like this former marketing professional. Some of the time might be paid and some might not but at least you’d have a choice. So you can add $5,000 to your band job now and we can compare again. 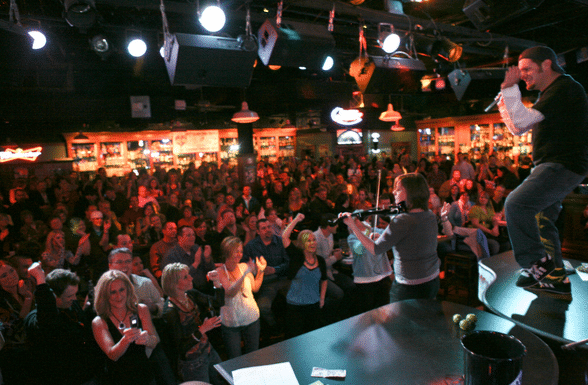 We’re now at $42,450 for the piano bar and $40,000 for the marketing job, YOUR DREAM JOB WINS! So we’ve literally only looked at your car expense and your free time lost in your commute and already the piano bar has come out on top FINANCIALLY. We’ve ignored the business events you have to go to, the charities you’re arm twisted into giving to, the girl scout cookies you’re peer pressured to buy, and other random expenses that happen in corporate settings that eat away at your budget. We haven’t even discussed the possibility of cheaper clothing you could wear at work, making your own lunch, or doing the occasional freelance marketing job to pick up some more income. The only risk is that the marketing job has better growth prospects but if you’re smart enough to get that job in the first place you’re smart enough to get a similar job back. Just make sure your new employer treats you as an employee not a contractor because it means an extra 6% in your pocket if you’re an official employee because of the way Social Security tax works. Also, do you think that future marketing clients would be more or less impressed with you that you took time off to follow your dream? People are not perfectly rational creatures, most will view you taking a risk like this as really bold and cool, and everyone likes working with cool people. If you are passionate about music, you can hone your craft and try to get really good. You might have a ton of psychic benefits that come with the new job as when you follow a passion its not going to feel like work which will make you a happier human being. The only other financial advice I’d give you is pay off your student loans to give yourself more flexibility. You should be able to come up with $1000 a month extra that can go straight to paying these off. If you’re really motivated see if you can pick up some work on the side with your newly found 10 hours of free time a week and dedicate this money to becoming debt free. I’m assuming the interest rate is in the 6% range so it beats investing in the stock market since it’s guaranteed risk free return. If you follow this advice you should be debt free IN TWO SHORT YEARS, YAHOOOOO!!!! So a lot of times the trade-off when choosing a job is between following your heart and being financially responsible. The awesome reality of this case study is one choice gives you both. GO BE A LEAD SINGER IN A PIANO BAND MARY! I expect free iTunes downloads when you make it big. Previous Previous post: Is the Patriots’ Rob Gronkowski More Frugal Than You?